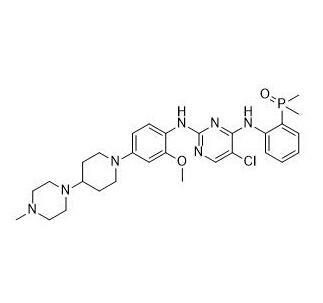 Brigatinib CAS number 1197953-54-0 referred to as AP26113, it is an inhibitor of lung cancer ALK target, is a non-small cell lung cancer targeted drugs. AP26113 is generally used after Crizotinib resistance, so in 2014 year the FDA awarded its tyrosine kinase inhibitor drug AP26113 orphan drug qualification for the treatment of methotrexate-resistant anaplastic lymphoma kinase Positive (ALK +) metastatic non-small cell lung cancer (NSCLC) patients. It has been shown that AP26113 inhibits at least 10 times more potency and selectivity than ALK bikazolidine , and that AP26113 is also effective for brain metastases in lung cancer. Lung cancer ALK target is actually a small market, because the probability of lung cancer ALK mutation is not high, but crizotinib in this area is ALK inhibitor currently the only one listed , the effect is also very good, AP26113 CAS number 1197953-54-0 is the second Models, can be considered the second generation of ALK inhibitors, AP26113 is expected to break the monopoly position of crizotinib. Looking for ideal ALK/EGFR Inhibitor 1197953-54-0 Manufacturer & supplier ? We have a wide selection at great prices to help you get creative. All the Non-small Cell Lung Cancer Treatment CAS 1197953-54-0 are quality guaranteed. We are China Origin Factory of CAS Number 1197953-54-0. If you have any question, please feel free to contact us.